Buyer agent peers -- yes BUYER AGENTS agents not listing agents -- said The Real Estate Cafe was being alarmist two years ago when we began blogging extensively about market trends foreshadowing yesterday's headline in the Boston Globe: "Housing slump may rival late '80's." As some home owners get "upside down" on their equity, or lose their homes by foreclosure, you may start to see a rash of litigation against the real estate "agents" who sold them their homes. Probably the vast majority of real estate agents acted as "buyer's agents" in the transactions, so there is likely the possibility some of these "buyer's agents" didn't really perform up to their expectation of "protecting" the interests of their "buyer clients." Didn't NEEP (New England Economic Partnership) predict a soft landing for the housing market two years ago, with prices declining just 3%? Wonder if my buyer broker peers, and sellers across New England, have updated their assessment of the housing market, too? Web-savvy home buyers: Be sure to use a buyer agent (without a conflict of interest) to steer clear of bubble trouble and maximize potential savings -- both from commission rebates and falling housing prices. 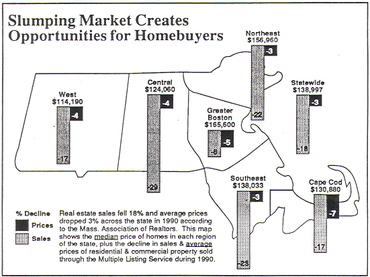 According to the graph average home in Boston in 1990 was $165K, now it is at least $350K. I wonder if the salaries tripled in the last 3 years. As far as I know they are almost the same for the last 10 years, in that case, who is making enough to keep buying these home is a mystery. EO: First of all, $350k is much closer to 2x of $165k, not 3x. Secondly, 99% of people don't pay cash for their house, so you have to look at the monthly payment, not the price of the house. Back in 1990, 30-yr fixed mortgage rates were running over 10% APR. They are now just over 6%. If you plug those numbers into a mortgage calculator assuming a 20% down payment, that leaves you w/a mortgage of around $1200/mo in 1990 and around $1700/mo today. In addition, ... 1990 to 2007 is 17 years, not 10 years. According to the US Census, the median household income increased 44% between those years. Guess what? An increase in monthly mortgage of $1200/mo to $1700/mo is 42%. This shows that housing is just as affordable as it was in 1990. Of course this is just a quick analysis which doesn't include property taxes, maintenance, and insurance which vary from property to property, but it just shows you that housing prices have risen faster from 2000-2005 in order to catch up for the stagnant prices from 1990-2000. Thank you both for taking time to post your thoughts, particularly you, Mike, because you've obviously done some calculations to add credibility to your position. If you read your comment, however, you will notice that I made a minor deletion, that I think Miss Manners, and Jim Lehrer, would approve. Lehrer delivered the commencement address at my daughter's graduation from Wesleyan this past weekend, and my hope is that his high-minded standards will continue to draw readers and comments to The Real Estate Cafe's blog. Mike and EO, thanks again for your respective perspectives. I hope others join your exchange online, and maybe offline over drinks at an upcoming "Bubble Hour." * Do nothing I cannot defend. * Cover, write and present every story with the care I would want if the story were about me. * Assume there is at least one other side or version to every story. * Assume the viewer is as smart and as caring and as good a person as I am. * Assume the same about all people whom I report. * Assume personal lives are a private matter until a legitimate turn in the story absolutely mandates otherwise. * Carefully separate opinion and analysis from straight news stories and clearly label everything. * Do not use anonymous sources or blind quotes except on rare and monumental occasions. No one should ever be allowed to attack another anonymously. * And finally, I am not in the entertainment business. But as you [debate positions and exchange perspectives], please, please be civil, be fair. One of the most serious losses we as a society have suffered in recent years in my opinion, is that of civil discourse. There is a meanness of communication alive in the land right now. I see it in the mail and the e-mail we get at our program. I hear it on television and the radio, read it in the newspapers and magazine and on the blogs and elsewhere on the internet. The controversies involving Iraq and the 2008 presidential election [and the real estate bubble] have and will continue to definitely heightened the passion of the rhetoric and the discourse at the moment. But there will always be difference because there must always be differences in a free and open democratic society. We are civilized people, we should disagree in a civilized manner. We should acknowledge the right of others to disagree with us. We should acknowledge the possibility that sometimes, some very rare times, we might be wrong. And strange as it may seem, we might learn more from listening than from talking, and more from talking than from shouting. First off, I sincerely hope we don't see anything as crazy as the slump of the market in the 80s. Although I don't have as much technical expertise as the last folks, I have been reading a bit on this matter. I've noticed different news sites mention that fact that a core problem right now in the housing market is that people can't afford homes! Ok, it's not that simple, but basically, in order to afford a mortgage, you've got to make a certain amount of money per month. Obviously. The problem is, home values are rising faster and therefore disproportionately to the median income of consumers. I guess really what I'm trying to say in my rambling way, is that part of the housing market problem is the fact that home values blew up faster and bigger than the income of the people who may want to buy the home. *shrug* Just my 2 cents worth - I don't have the grasp on it that a real estate agent would, but as I've said, I've been reading around.